Our Premiere Plug-In can export MPEG video with embedded closed captioning. Our new Expert-Broadcast plug-in embeds captioning into video during export thus eliminating the extra caption insertion step. This will save you time and money and produce quality compliant video for your broadcast channel. The first step in adding captions to your video is to transcribe the captions into a file with text and time code (unless your captions are already embedded as analog in the video). 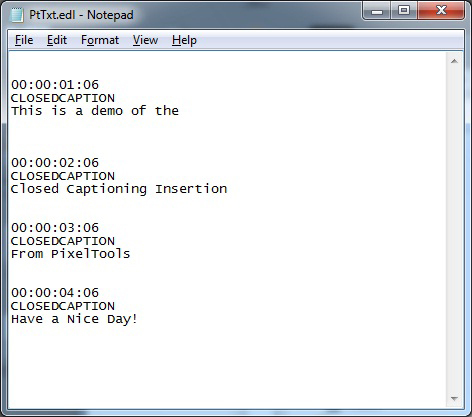 Our captioning process accepts captions in text files, .EDL files, .SCC files, and other file formats. There are quite a few tools ranging in price from free to several thousands of dollars available to assist you in this transcribing process. There are also agencies that, presented with your audio file, can generate a transcribed file. At this point in the authoring process, have your edited video on the Adobe Premiere Time line and have access to the transcribed captions file. 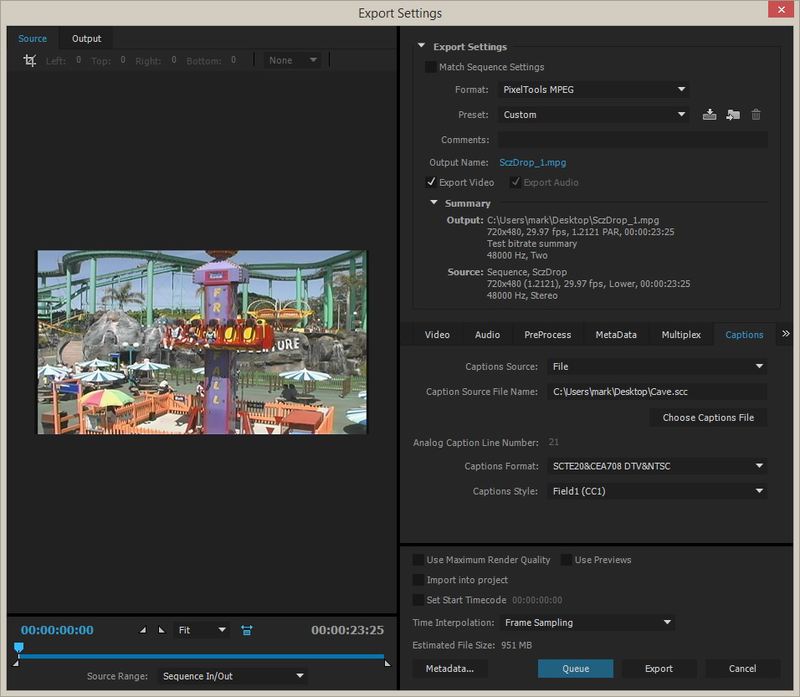 Highlight your video on the time line and select File | Export | Media to bring up the Media Export Dialog. In the upper right of this dialog in the Format drop down menu, select the PixelTools MPEG option. This brings up the PixelTools Export Settings dialog. Set up the export settings as you would using Premiere's MPEG exporter tool. Our Exporter, in addition to providing higher quality video compression, enables you to embed your closed captioning in the elementary video allowing you to export files that comply with broadcast standards. 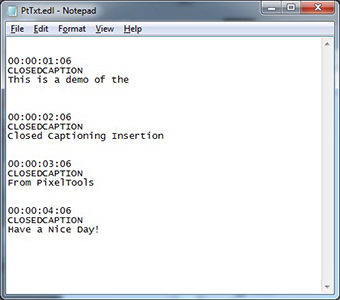 Select the Closed Captioning tab, then select the captions source File, and browse for your captioned .SCC file. You can also cause visible analog captions that are embedded in your video to be properly inserted as digital captions by choosing the Analog Caption option and entering the Analog Caption Line Number where they are inserted into the video. In either case, select your desired Caption Format. For most situations, the CEA-708 DTV&NTSC format would be most appropriate as this inserts 608 captions and translates the captions to the exact equivalent. 708 captions so that decoders can use either the 608 or the 708 captions. CEA-608 is a specification that defines closed captions for Analog Standard Broadcast video. CEA-708 is a more modern specification that defines captioning for Digital HD broadcast. It is also possible to insert Open Captions or Subtitles into the video by selecting the Closed Captioning Format | Open Captioning. This will cause the 608 captions to be inserted into the video and they will always be visible. The user can not turn them off like closed captions. To encode your video and simultaneously embed the captions, just depress the Export button. The resultant video will have the 608 and 708 captions embedded in elementary video user_data and not just a “Side Car” file. The captioning format is compliant with ATSC and most broadcast and onboarding standards. All PixelTools products and upgrade purchases include 6 months of free tech support and product upgrades. Additional tech support and upgrades are available under a PixelTools maintenance agreement. Contact us for volume pricing and information on custom development options for any of our products. Not sure which product to buy? Compare our updated product features at a glance.